Maintaining a visitor’s register has always been the tradition but this system has some flaws. First, you have to expend a great amount of energy maintaining the records and secondly it didn’t have any security feature. And the time o the receptionist it wasted in writing down the name and purpose of the visitor, the old system was many faults. Due to this, they have been the demand of a better visitor management system. This has been heard by the developers of iLobby who created the best visitor management system of the world. When it comes to digital management systems, there have been many attempts at creating a good system. But all these attempts were a failure as compared to iLobby. This visitor management system has been created keeping in mind the importance of efficiency of the reception desk. 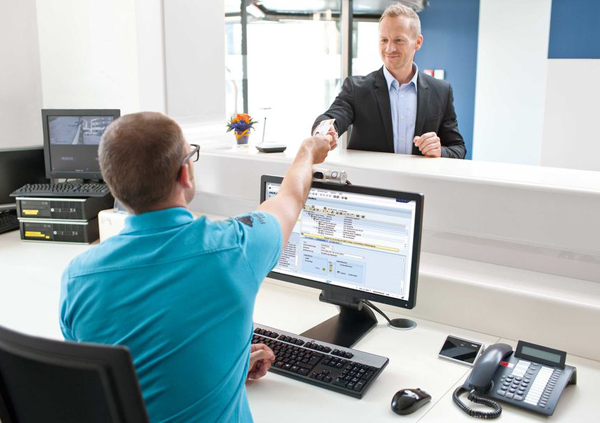 Thus instead of a receptionist writing down the details of the visitor in a record register, the visitor can themselves do the work through a display device. These can be either an Android tablet or one of the Apple ones. iLobby records the name, company, phone number, email, and purpose of the visitation. When all this is filled, you will get a notification on your email or phone number through SMS/MMS about the visitor. iLobby snaps a photo of the visitor for identification purposes, which is also sent through the email. You can choose whether you want to meet the person and inform the receptionist about the same. This is the best visitor management system that allows you to manage the visitors in various industries. This visitor management solution can be used in Schools, colleges, healthcare facilities, workplaces, manufacturing units etc. With the clean and easy to use interface, you will be able to effectively and efficiently manage your visitor and remove the hassle faced in traditional record keeping method.